Since when could laws violate causality? In 1996, Australia implemented stringent gun control laws in response to a mass shooting. After this, gun related deaths dropped considerably. But why? 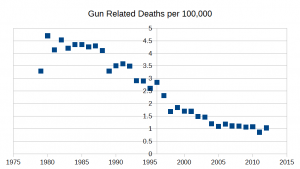 The decline in gun related deaths, in Australia, is used to argue that gun control laws save lives and that similar gun control measured should be implemented in the United States. However, this argument comes from either ignorance or dishonesty. While it is true that the rate of gun related fatalities declined post 1996 a quick look at gun related fatality data, available at GunPolicy.org shows that the trend is not new. Between 1979 and 2012, gun related deaths were highest in 1980. At the time, the average number of gun related deaths was 4.7 per 100,000 while in 1995 that number fell to 2.61 per 100,000. That’s almost a 50% decrease. But there’s more. The trend takes on a recognizable pattern. Graphing the 1979–2012 rates presents what appears to be a clear logistic curve. I have included a plot of the 1979–2012 data. It’s clear that by 1996, the downward trend is already in place, and indeed it appears that the point in which the trend begins to slow down is somewhere around the 1996 mark. Logistic curves show up in a variety of areas, but in social science, they are important in modeling the spread of ideas. It is essentially the same model that is used in epidemiology. The thought is that an idea primarily spreads when someone who supports the idea comes into contact with someone who does not, and the person who supports the idea manages to convince them in the process. When very few people agree with the idea or when most people agree with the idea, the contact rate between the two groups is low. However the contact rate, and therefore the rate of growth, peaks when both populations are equal. If the decline were due to legal changes, would we still expect to see this kind of pattern? Maybe, but it is less likely, especially since the start of the pattern far predates the major legislative actions which took place in 1996. So, while certainly not conclusive evidence, this does suggest a social change rather than a legal change as the cause of the reduction in fatalities. Note: I could have redone the analysis, as data is available through 2016, but there’s really little change from this data. Rates are flatlined near 1. GunPolicy.org. 2015. ‘Calculated Rates — Australia (Total Gun Deaths).’ Historical Population Data — USCB International Data Base. New York, NY: US Census Bureau Population Division. 13 February.